Memorial: November 16 - in Germany: November 17 Also known as: Getrude; Gertrud the Great of Helfta, Gertrude the Great Saint Gertrude is one of the greatest and most wonderful saints in the Church of God. Gertrude was born January 6, 1256, in Eisleben, Thuringia ((part of modern Germany). When she was about 5 years old, she became a student at the Benedictine monastery at Helfta, near Eisleben (southwest of Magdeburg, Germany). The Abbess at the time was Gertrude of Hackerborn a woman who ensured that both spiritual and intellectual life flourished. The child Gertrude was put in the care of Mechthilde (became later a Saint), the sister of the Abbess who was head of the school associated with the monastery. Gertrude studied the Scriptures, the Liturgy, and the writings of the Fathers of the Church. Her life was crowded with wonders. She has in obedience recorded some of her visions, in which she traces in words of indescribable beauty the intimate converse of her soul with Jesus and Mary. Gertrude had her first vision of Christ at the age of twenty-six. She tells us that she heard Christ say to her, "Do not fear. I will save you and set you free." This was the first in a series of visions that transformed her life. From then on, she spent many hours reading the bible and writing essays on the word of God. When she was asked to write about her experiences, she claimed that it would serve no purpose. When she was told that her words would encourage others, Gertrude agreed to write spiritual autobiography. Gertrude committed to writing many of her mystical experiences in the book commonly called the "Revelations of Saint Gertrude." These Revelations form one of the classics of Catholic writing. And although they would have to be classified as “mystical literature,” their message is clear and obvious, for this book states many of the secrets of Heaven in terms that all can understand. Recorded here are Saint Gertrude's many conversations with Our Lord, wherein He reveals His great desire to grant mercy to souls and to reward the least good act. In the course of their conversations, He reveals wonderful spiritual “shortcuts” that will help everyone in his or her spiritual life. She also composed many prayers, ‘sweeter than the honeycomb’, and many other examples of spiritual liturgically inspired Exercitia spiritualia is a gem still awaiting in-depth analysis. But Gertrud’s most important legacy is universally acknowledged to be the Legatus memorialis abundantiae divinae pietatis, or Herald of the Memorial of the Abundance of Divine Love. This complex work, usually abbreviated in English to The Herald of Divine Love, is worthy of attention both in itself and as a fascinating test case for the study of medieval women’s theology. Another most important book is “The spiritual exercises”. Through her writings helped spread devotion to the Sacred Heart. She meditated on the Passion of Christ which many times brought a flood of tears to her eyes. She had a tender love for Our Lady. During the long illness of five months from which she would die, she gave not the slightest sign of impatience or sadness; her joy, on the contrary, increased with her pains. When the day of her death arrived, November 17, 1302, she saw the Most Blessed Virgin descend from heaven to assist her, and one of her Sisters perceived her soul going straight to the Heart of Jesus, which opened to receive it. Saint Gertrude died at Helfta monastery of natural causes. 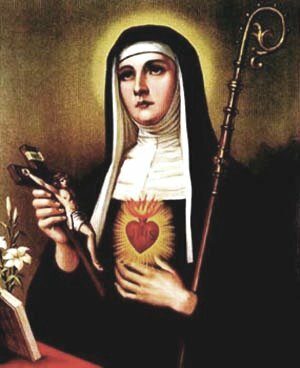 She is properly known as Saint Gertrude for, although never formally canonized, she was equipollently canonized in 1677 by Pope Clement XII when he inserted her name in the Roman Martyrology. Her feast was set for November 16. Pope Benedict XIV gave her the title "the Great" to distinguish her from Abbess Gertrude of Hackeborn and to recognize the depth of her spiritual and theological insight. When the community was transferred in 1346 to the monastery of New Helfta, the present Trud-Kloster, within the walls of Eisleben, they still retained possession of their old home, where doubtless the bodies of Saint Gertrude and Saint Mechtilde still buried, though their place of sepulture remains unknown.